Paris, France, between 1230 and 1239. Previously in antique, stamped, by Léon Gruel; rebound in russet morocco by Marguerite Duprez Lahey in the 20th century. Bought in Aug. 1895 by William Morris (1834-1896); Richard Bennett (1844-1900); Catalogue of manuscripts and early printed books from the libraries of William Morris, Richard Bennett, Bertram, fourth Earl of Ashburnham, and other sources, no. 74; purchased by J. Pierpont Morgan (1837-1913) with the Bennett Collection in 1902; J.P. Morgan (1867-1943). 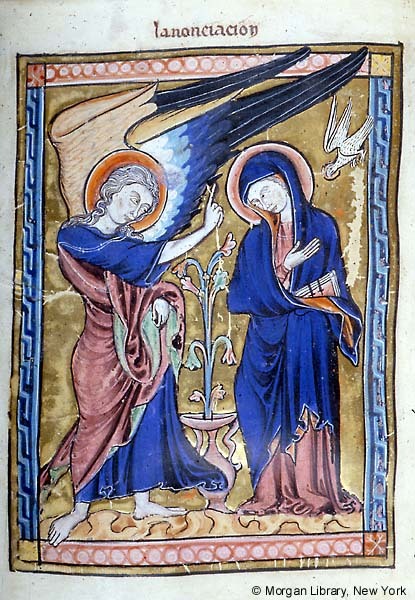 Ms. book of hours for the use of Soissons; written and illuminated in Paris, France, in the 1230s. Decoration: 14 full-page miniatures, 94 historiated initials, 24 calendar illustrations.